In anticipation of the freezing weather coming this week I was in the mood for something hearty and warm so decided to make chili. I was also in the mood to invent a new recipe and found that my pantry and fridge were barely stocked with chili ingredients. 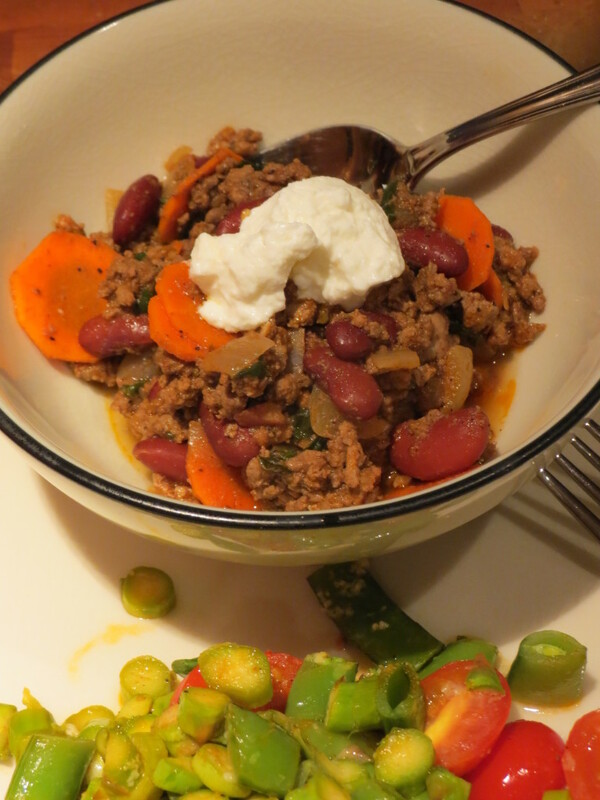 This is how beef and vegetable jerked chili was invented. I am really pleased with the results and Geoff described it as both delicious and amazing… so that is a victory in my book! 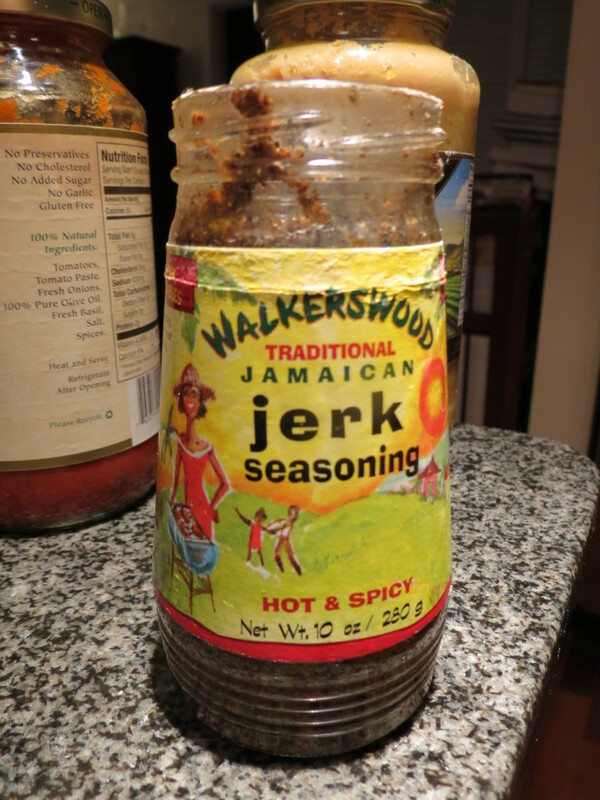 Jerk seasoning is a blend of onions, hot peppers, nutmeg, allspice, and some other spices. You can find it in the international food aisle of most supermarkets and it also lasts a long time! I added 2 tsp of jerk seasoning and it gave the chili a nice lingering heat. 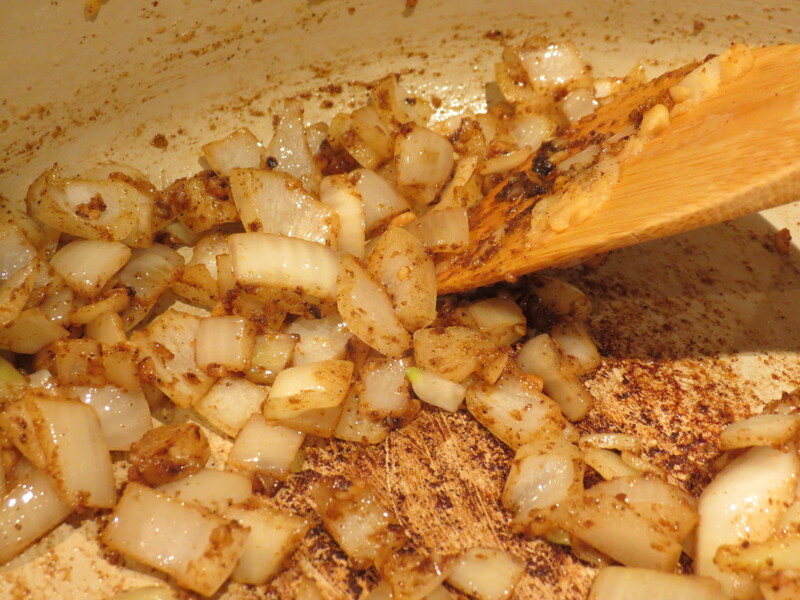 If you aren’t a big spicy food fan you can add 1 tsp or less or skip it all together. I added this when the ground beef was mostly cooked. At this point I also added 1 cup of thinly sliced carrots. 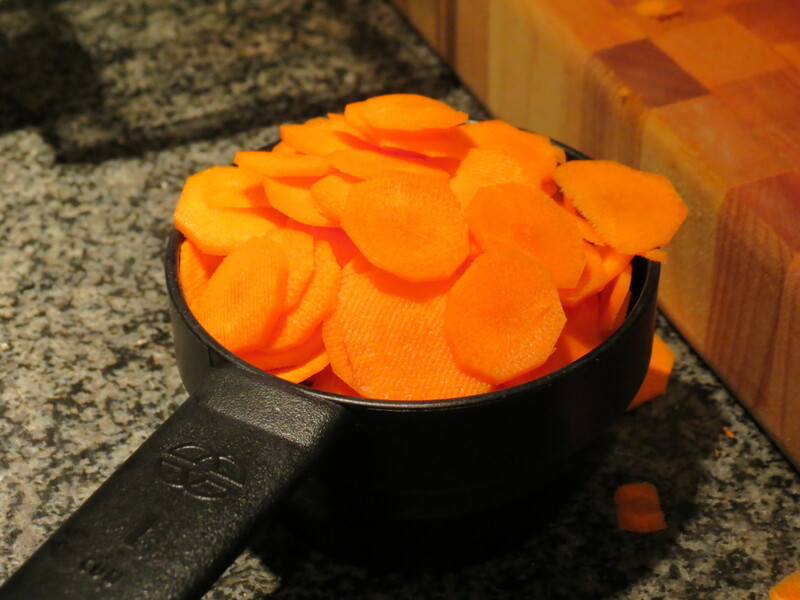 I sliced them thinly mostly because I’m a little obsessed with my mandolin but also because it’s kind of a pain to dice carrots. That being said, you can dice your carrots and add them in along with 1/2 cup water and 1/2 cup tomato sauce. If you have canned tomatoes or tomato paste you can add that– it will give it a stronger tomato flavor without many calories. I just used the pasta sauce that I had open in the fridge (are you noticing a theme of how I cook?). Add 1 can drained kidney beans and mix in. Cover and let the beef finish cooking. This will also help the flavors combine. At this point things were looking a little red in the pot so I wanted to add some colors. I didn’t have any green peppers and Geoff doesn’t like celery so I decided to use spinach. I roughly chopped 1 cup of spinach and added it in so it could wilt down. At this point you want to start tasting the chili. Mine needed the flavors to boost a little, so I added 1/4 tsp garlic salt and 1 Tbsp fat free greek yogurt to add a little creaminess to the dish. At this point you can let the chili simmer for as long as you want. 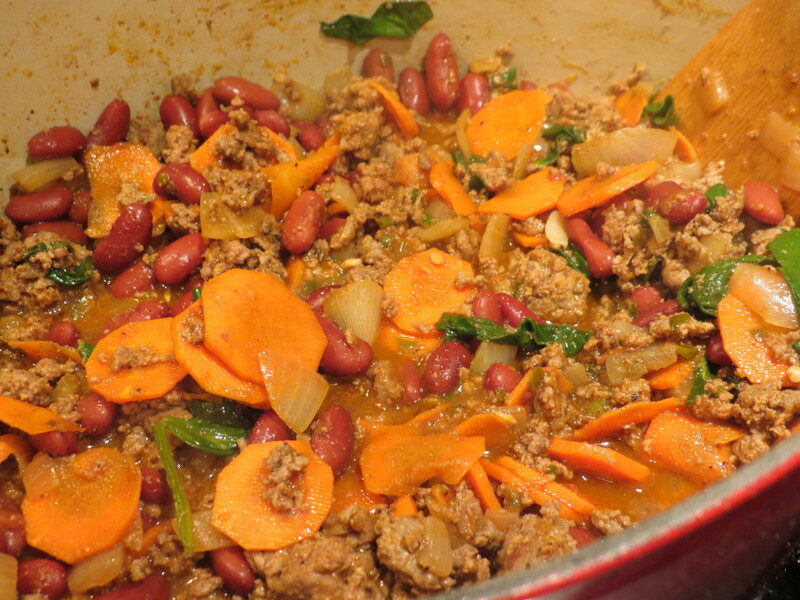 Chili is one of those dishes that gets more and more delicious with time. We were pretty hungry so I just served it immediately (and it got those nice reviews from Geoff so just think how good it will be tomorrow!). I added a little more greek yogurt to help cut the heat and give more creaminess to the dish. You can use sour cream if you want. This made 6 servings at 195 g each (about 1 cup) for 6 weight watchers points +. The side dish that you see is a spin on my mixed vegetable gratin with asparagus, sugar snap peas, and tomatoes. This dish was so hearty and filling and a perfect end of the long weekend meal.